At an emergency call a patient has a sudden loss of consciousness and her ECG is as seen on page 14. Assess ABC, ALS algorithm, unsynchronized defibrillation. Magnesium. Prevent recurrence by pacing or isoprenaline to increase the heart rate to a level that prevents further torsade. 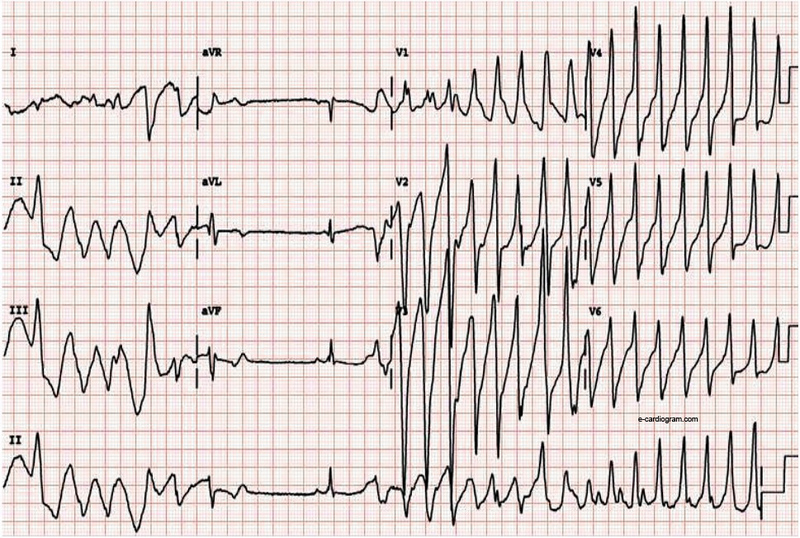 The official college ECG image is of course not available, and in most such cases the reader needs to acknowledge the possibility that the author has substituted something completely different to the official college paper. Fortunately, this time examiners made the mistake of leaving a faint "e-cardiogram.com" watermark on their paper, which makes it possible for track down their source to this page, where a detailed exploration of "tachycardie ventriculaire polymorphe" takes place. This file (torsades-de-pointes-web-free.jpg) has been reproduced multiple times, and appears to be something of a classic. a) What is your diagnosis? To be perfectly precise, that would have to be "Polymorphic VT". If the complexes clearly demonstrated a rotation around an isoelectric point "Torsades des Pointes" would also be reasonable, especially given the file name, and the fact that the one visible normal-looking QRS complex appears to have a relatively long-looking QT interval. The fact that the VT begins during the T-wave suggests that the R-on-T phenomenon is responsible. For 10% of the total SAQ marks, no more detail would be expected. Given that the patient has lost consciousness, "cardiac arrest" is another potentially valid way to describe the situation. b) is also a 10% question. "What risk factors could precipitate this arrhythmia?" Generally speaking, non-Torsades VT is associated with organic and structural heart disease, whereas Torsades tends to be related to molecular and channel related problems. c) How will you manage the patient? Priori, Silvia G., et al. "Clinical and molecular characterization of patients with catecholaminergic polymorphic ventricular tachycardia." Circulation 106.1 (2002): 69-74. Koplan, Bruce A., and William G. Stevenson. "Ventricular tachycardia and sudden cardiac death." Mayo clinic proceedings. Vol. 84. No. 3. Elsevier, 2009. John, Roy M., et al. "Ventricular arrhythmias and sudden cardiac death." The Lancet 380.9852 (2012): 1520-1529. Pelosi, Frank, et al. "Effect of chronic amiodarone therapy on defibrillation energy requirements in humans." Journal of cardiovascular electrophysiology 11.7 (2000): 736-740.